Serve it as a starter, or a very light meal in itself. I always enjoy home made broths and soups. They are fresh and without any stabilizing agents, hence more nutritious. This bone broth recipe is a very Indian recipe as it uses Tur dal but you can easily substitute tur dal with oats and coriander with celery. The base I love to use is mutton bones, but this broth will taste just as good with Beef or Chicken bones. 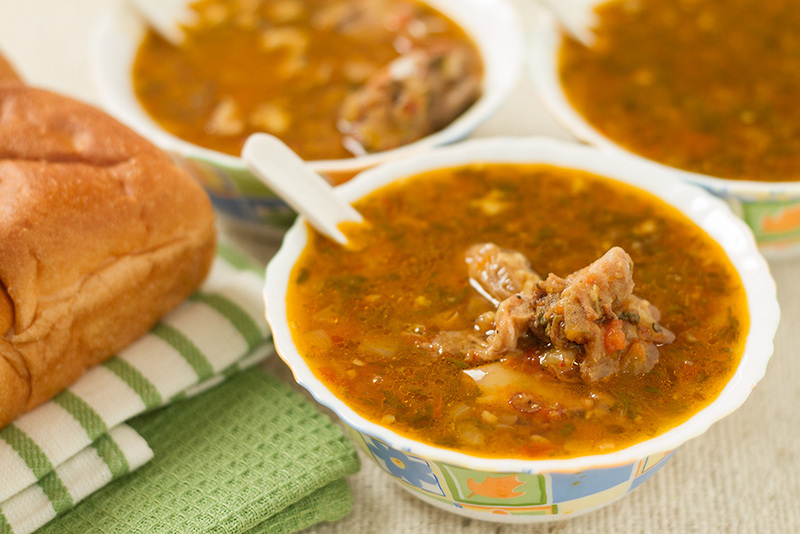 An excellent pre-dinner soup for cold nights, Bone broth also relieves mild sore throat and cough. If you like the soup thinner, strain it and serve, and if you like it thicker, add some more dal during the cooking process. I, however, would not advice using more than 2 Tbsp dal as it would change the taste completely. Broth has been made for many years using the animal bones which, traditionally, are boiled in a cooking pot for long periods to extract the flavor and nutrients.The bones may or may not have meat still on them.Egg whites may be added during simmering when it is necessary to clarify (i.e., purify, or refine a broth for a cleaner presentation). The egg whites will coagulate, trapping sediment and turbidity into a readily strained mass. Not allowing the original preparation to boil will increase the clarity.Roasted bones will add a rich flavor to the broth but also a dark color. In a pressure pan heat ghee, add onions, ginger and garlic and fry till the onions turn translucent. Add to it tur dal, turmeric powder, pepper powder, cumin powder, chopped tomatoes, half of chopped coriander, mutton bones and about 3 glasses of water and salt. Close the lid and reduce the flame after the first whistle. Cook for about 35-40 minutes on low flame. Open the pressure pan after the pressure drops on it's own. After opening the pan, switch on the heat, keep it on low flame for 2-3 minutes Taste for pepper, cumin and salt and adjust them to your taste. Garnish with remaining coriander leaves. Serve hot with bread. This broth goes well with steamed rice too.